A shy Rabbit woman will make the fortune of a strong, confident man. The Chinese horoscope represents her as a soft, gentle person, dreaming of finding a reliable defender. It’s easy and simple: a tactful woman does not pretend to be a leader in a love relationship. This is the real keeper of the hearth, able to protect loved ones from problems. In relations with her, there are no quarrels and scandals, or rather, this is a great rarity. Rabbit may seem too calm woman, far from sensual pleasures. However, the appearance is deceptive, under the mask of equanimity, the storm of passions is raging. The Rabbit Woman is not at all indifferent to her fans, she simply thinks: the first step is to be made by a man, and her role is submission. With pleasure, she will respond to the courtship of the gallant chevalier, and perhaps surprise him with her profound knowledge of the art of love. For this, the chosen one will have to overcome the natural shyness of the Rabbit woman. A delicate woman does not know how to openly show her feelings and emotions, so a man will have to take the initiative himself. No matter how strong the attraction is, it will not provoke the lover to take active action. With pleasure, she will support his initiative, the ardent feeling of a man will not remain unanswered. The Rabbit Woman is ready to plunge into the whirlpool of love passions. Of course, for this it will take a little time and careful attitude of the partner. An intimate horoscope characterizes the woman-Rabbit bed as a shy partner. It is difficult for her to be liberated and unchecked, but has all the necessary qualities to make a man happy. It is only necessary to find the right approach. Do not hurry, she likes long caresses, needs a delicate attitude. Easily responds to tenderness and care, without fear agrees with any offers of a partner, trusts him in everything. There is so much passion and fire in it, it only remains to inflame the flame of love in it. In bed, the Rabbit woman will not look for sophisticated ways to surprise her lover, just be sincere and natural. It gives pleasure to intimacy, but it irritates too aggressive, rigid pressure. With the insolent, shameless behavior of the chosen one, she will not reconcile, even if she feels strong feelings for him. Perhaps a timid woman will go on about the wishes of a partner, try to accept the rules of his love game, but such an alliance will not last long. Rabbit is looking for a refined, attentive and gentle lover, and not a man with a perverted consciousness. 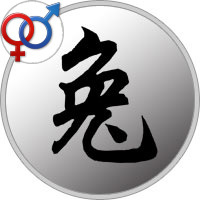 A woman of this sign is distinguished by a quivering attitude towards her lover, she sincerely admires him. In her understanding, a man is perfection, an indisputable authority. Therefore, Rabbit strives for an ideal relationship, never argues or scandals with a partner. With a decent behavior of a man, conflicts with a woman of this sign are impossible. It will become for the chosen one to everyone: a devoted partner, a passionate lover, a good wife. In bed with joy recognizes the leadership of a man, obediently follows all his desires. It is important for a Rabbit woman to create an ideal alliance: partners love and respect each other. Intimate relationships are not of great importance to her, she needs more warmth. Only a caring, quivering attitude of a man can wake her passion. For the chosen one is ready for any feats, so she will definitely become such a mistress as he wants to see her. She has a desire and temperament, Rabbit is waiting for her man, who can entrust her heart. In these relationships, you do not have to perform knightly deeds or invent especially original ways to entertain a capricious woman. For the Rabbit is quite enough, if you just carry out their male responsibilities: care, attention, protection. Act neatly and tactfully, be calm and confident, the woman of this sign will appreciate you. In an intimate relationship, do not be afraid to take the initiative, calmly feel about her shyness and shyness. If you can win her trust, it will open completely from the other side. Rabbit can be a passionate and emotional partner. The Rabbit woman remains faithful to her man, therefore fleeting intrigues are excluded. Completely immersed in a relationship, completely ignores other men. Do not get you harassed by interrogations, especially not to sink to gossips and intrigues. But if she feels cold and alienated, she will most likely prefer to part. The truth and your jealousy will cause in her bewilderment and surprise, it is better to refrain from unreasonable claims, so as not to destroy a harmonious union. Relations with the Rabbit are full of tenderness and love, so enjoy her company, just be yourself: a strong and reliable man. Most Important: How to Seduce a Rabbit Woman? For all her timidity and indecisiveness, the Rabbit woman perfectly understands what kind of man she needs. Therefore, with dreams of a quick victory over her heart, you can safely part. This is a very cautious woman, even a huge sympathy for a man — not a reason for a close relationship. She is waiting for beautiful courtship and deeds. Each gesture must testify to your deep respect for this amazing woman. Infinitely shower with compliments, admire not only her beauty, but also a high moral image. For the first date, you need to choose some particularly romantic place. Do not lead a female rabbit in a trendy restaurant or in a nightclub. She will not enjoy the contemplation of a huge crowd, and loud music, most likely, will be annoying. It is better to choose a small cozy cafe or offer a walk in a quiet park. Do not forget about the bouquet of flowers, the female Rabbit will appreciate your touching gesture. Try to be interested in her opinion on any issue, entertain conversations on a variety of topics, of course, if they like her. In general, be a gallant knight in the best traditions of romance novels.